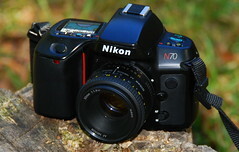 The Nikon F70 or N70 as known in the US is a auto focus 35mm SLR camera introduced in 1994. 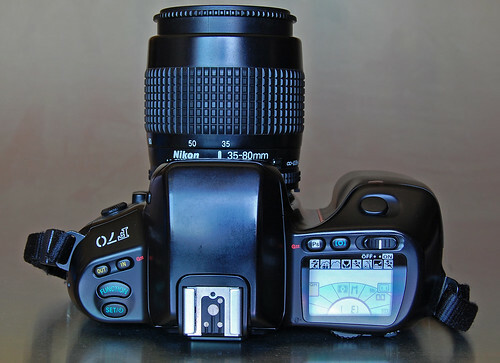 Compared the other models in the line up, it has a unusual interface which requires the holding of buttons on one side of the camera; as well a moving the thumb dial on the opposite side; and viewing the settings in a circular interface on the LCD screen. The motorized film transport can advance film at up to 3.7fps in high continuous mode; in low approx 2.0 fps; in focus tracking, approx 3.1 fps for continuous servo AF mode. There is also a silent rewind feature which reduces the speed of the drive so there is less noise, because of this rewinding takes longer. 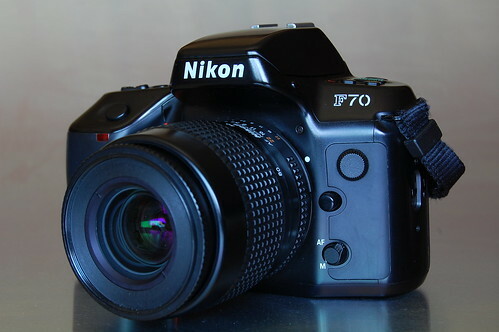 The F70 is compatible with Nikon F mount lenses, the preferred lenses include AF, AF-D, AF-S and AF-I lenses, all functions of the camera and P, S, A, M program modes will operate with these lenses. VR lenses will work but with the Vibration Reduction function disabled. AI, AI-S as well as converted AI lenses will work as well but will not function in matrix meter mode. It will operate in center weighted and spot meter modes, with A and M program modes. G lenses will work as well, but with only P and S program modes. Shutter: electronic, 1/4000 to 30 sec in 1/3 EV and electromagnetic B setting. Film speed: Auto DX 25 to 5000 ISO; manual 6 to 6,400 ISO. This page was last edited on 15 October 2014, at 19:06.